Like many others, we’ve been watching the effects of Hurricane Harvey in southeast Texas, stunned by the images of record setting flooding and the impact on residents. In particular we’ve been thinking of all of our friends and clients in this area. As is typical of helpline work, they have an important role to play in disaster planning, relief and recovery, all while their own homes and families are at risk. We’re told that 2-1-1 Texas has remained operational throughout — a truly amazing feat in the wake of this historic hurricane. As we hear from them and gain permission to share their experience and stories of those they helped, we hope to bring that information to you. Harvey serves as a reminder to all non-profit services and particularly helplines, contact centers, and 2-1-1s that you have a role to play in your community’s disaster plan as government services look for partner organizations that can disseminate life-saving information, offload call volume to government switchboards, and provide information across a variety of communication methods to make sure everyone is reached. Meanwhile, these not-for-profits naturally have to concern themselves with the safety of their own staff and their own infrastructure in order to remain operational. With Hurricane Irma now making its way towards North and Central America, and months left in hurricane season, it’s time to consider your disaster plan. And of course disaster goes far beyond tropical storms and flooding. Wild fires, earthquakes, tornadoes, blizzards, and other forms of disaster threaten communities across the globe. We’ve recently been made aware of a website that provides a number of free resources helpful to any organization as they plan and prepare for disasters. You can access these resources here. If you are interested in aiding in Harvey relief efforts, the United Way has announced establishment of a Harvey Recovery Fund. In the midst of these events it’s usually recommended to donate money rather than items, as storage space tends to be in short supply but cash allows organizations to purchase items on the ground for immediate distribution. They’ve offered information on the various ways you can make meaningful contributions on their website. We extend our warm thoughts to everyone impacted by Hurricane Harvey. If you have information about relief efforts or if your organization has been directly impacted by Harvey and you would like to share your stories, please . Photo appears courtesy of the United States Department of Defense. U.S. Marine Corps photo by Lance Cpl. Niles Lee. Happy Anniversary to North Carolina 2-1-1! 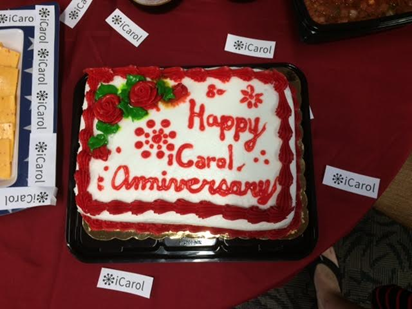 Our friends at United Way of North Carolina/NC 2-1-1 are celebrating their first anniversary with iCarol in the best way possible — snacks and cake shared amongst their hardworking staff! We think our logo looks pretty delicious as a cake decoration. It’s been quite an eventful year for their team, including navigating the challenges that came with Hurricane Matthew and the subsequent flooding in their region. Through it all the dedicated people at NC 2-1-1 were there for the community, connecting them with resources and logging over 12,000 interactions into iCarol during that disaster. Wow! We just love that they took the time to recognize the milestone and we couldn’t be happier to count them among our users. “Happy Anniversary” to the entire team in North Carolina! We appreciate the great work you do and are thrilled and honored to have you as a part of the iCarol family! In the wake of Hurricane Matthew, many states in the southeastern United States faced destructive damage including massive flooding. Raleigh, NC – NC Emergency Management has asked NC residents affected by Hurricane Matthew or those wishing to help with disaster relief to dial 2-1-1 for storm related resources. Residents in all 100 counties can dial 2-1-1 from any phone to reach a trained call specialist who can help them find shelters, and learn about evacuation routes, find help with storm clean-up, locate food, water and ice, learn more about volunteer needs and more. The service is available 24/7 in any language and callers will always be connected to a live call specialist trained to assist during disasters. NC 2-1-1 call specialists are in contact with emergency management personnel and have the most up-to-date information on storm related resources, both during the storm and after. Call specialists can provide evacuation and shelter information, help people find food, water and ice distribution points and storm clean-up information and help, and help people find storm related clean-up help. Call specialists also have information about volunteer and donation needs and can provide that information to callers wishing to help those affected by the storm. NC residents should dial 2-1-1 or 888-892-1162. In addition to disaster related calls, NC 2-1-1 can help NC citizens find resources for other health and human service needs, such as food, housing, assistance with utilities, job training, information about health care providers, and more year round. All calls are confidential and the service is offered at no cost to North Carolina residents. NC 2-1-1 is provided to residents in all 100 North Carolina counties by United Way. The service is free, confidential, and available 24/7/365 in any language. NC 2-1-1 staff shared with us that amidst the challenges of the situation, their service is standing out and being recognized by leadership throughout the state for their availability and outstanding service to their community. The system has proven itself to be a great tool to help citizens in need, and the people reaching them are feeling comforted, and pleasantly surprised, when they reach a live person. We’re honored to be NC 2-1-1’s choice of software providers and we’re glad that iCarol has been an instrument to help them help people and produce important data for emergency management personnel, while reducing stress on their staff. Our thoughts continue to be with them and with all the people in the southeast US affected by Hurricane Matthew. Heavy rainfall over the course of several days has resulted in severe flooding in parts of Louisiana. Here at iCarol our thoughts are with the people of Louisiana as well as our friends and partners at the United Way agencies and 2-1-1 call centers in the region who are helping those affected. Many of the people working at these agencies are currently facing the same hardships as the people they’re trying to help, and so it’s very inspiring to see their energy used in service to others at a time that may be just as difficult for them personally. Our team also extends our love and support for our very own Christa who lives in Baton Rouge. We hope the flood waters recede soon so that everyone can be safe, regain power and other necessities, and begin the repair and recovery process. St. Landry-Evangeline United Way, United Way of Acadiana, United Way of Iberia and United Way of Southwest Louisiana have partnered to launch the Greater Acadiana United Way Disaster Fund. To donate, text keyword FLOOD2016 to 41444, visit each individual United Way web site or contact the individual United Way. United Way-supported programs with nonprofit partner agencies help provide food, clothing, counseling and other services. United Ways are partnering with local residents and partners in the non-profit sector, businesses, faith-based sector and government to help people through the recovery process. United Ways are also working with Volunteer Organizations Active in Disaster (VOAD) to assess all other volunteer needs. Once those other volunteer have been identified, a United Way representative will contact registered volunteers with additional information. You can register to volunteer for emerging volunteer needs at www.unitedwayofacadiana.org or www.getconnected.uwsle.org. United Way of Acadiana is accepting donated goods at its warehouse at 215 E. Pinhook Rd. from 8 a.m. to 6 p.m. daily until further notice. This location is the staging point for all donated supplies, which will be dispersed to shelters and other places where needed. United Way of Acadiana is also working in collaboration with The Daily Advertiser, which is also a drop-off site for donated goods until Monday, Aug. 15. There is not a need for clothing donations at this time. With the continuing devastation occurring in our community, Capital Area United Way is now accepting donations for flood relief. During this historic flood, most of our 10-parish area has been deeply affected, and we stand together with local partners in the non-profit sector, businesses, faith-based sector and government to help people through the recovery process. Basic needs is one of the focus areas for Capital Area United Way to stabilize individuals and families in times of crisis. To make a donation text LAFLOOD to 313131 or visit www.cauw.org and click donate. Donations can also be mailed to Capital Area United Way, Attn: Flood Relief, 700 Laurel Street, Baton Rouge, LA 70802. For volunteer opportunities visit www.cauw.org/volunteer. In addition to monetary gifts, Capital Area United Way is accepting donated goods (listed above) at its office at 700 Laurel Street from 8:30 a.m. to 4:30 p.m. daily until further notice. This location is the staging point for all donated supplies, which will be distributed to shelters and other locations where needed. Ample staffing at your non-profit helpline is always a top challenge, but bad weather brings with it a whole new set of staffing hurdles. Snowy and icy conditions* can especially spell trouble for seamless shift coverage. Particularly powerful storms not only disrupt travel for days, but they have the potential to impact essential infrastructure like electricity and running water. These weather events take strategy and pre-planning to work through them successfully. Depending on the severity of the storm, you may have no special plan at all except to tell your specialists that they are expected to be there for their shift or find a substitute to cover for them. In many snow storms, travel is possible so long as precautions are taken, such as driving at slower speeds and being extra vigilant. Call centers in urban settings may also benefit from having volunteers living within walking distance or taking public transportation. The show must go on – Shifts go on as scheduled no matter what. Workers who can’t make it in must give ample notice and find substitutes who are able to travel. iCarol’s shift scheduling tools support you and your staff throughout this process; automatic substitute request emails greatly improve the visibility of your needs and the chances of pick-ups from others. Pros: Little to no prior planning or change to your normal operations. Cons: The absence of any back up plan can spell trouble, so you should have some alternative options in mind just in case. Your volunteers may have the best intentions of making it in, but the reality is that Mother Nature can easily stop us in our tracks and there’s only so much a person can realistically do when faced with heavy accumulations and impassable roads. You won’t want to be faced with the scenario where the previous shift is stuck with no relief. Take a moment to also consider the consequences of a potential road accident and injury to your volunteer when traveling in dangerous conditions, and the emotional and potentially litigious repercussions of demanding that volunteers travel in unsafe conditions. Further, when a State of Emergency is declared, it often requires that road travelers have their vehicle outfitted with special equipment, and drivers disobeying the order may even be fined. Transfer your calls – In some instances there may be a partner agency, satellite office of your program, or a back-up center in an area unaffected or less affected by the weather, and they can take the lead on operations for a period of time. Our Call Report form sharing functionality makes it easy for you to pass your service delivery on to other centers, while they use your preferred form(s) to log the interactions they’re taking on your behalf. This also ensures your data collection and the resulting reporting can be seamless regardless of who is actually providing the service. Pros: Less direct impact on you, your volunteers, and staff during the event. Being able to simply forward your service to someone else is very convenient. Cons: This does come with a few sacrifices. First, your service delivery is being entrusted to others for a period of time. Necessary MOU’s and other contracts should be in place well in advance to ensure that same or acceptable level of service will be provided by the back up center. Consider any financial compensation that must be paid out as well. And you’ll want to have understandings about proper data collection, call handling policies, and more. Work from home – Technology has made it easier than ever to turn any setting into a call center, even your workers’ homes. Calls could get forwarded to that worker’s personal phone or a phone loaned to them from the office. Chats or texts can be taken from virtually anywhere as well. Special tip for iCarol users who might employ this method: You must either turn off ‘Restriction’ (the feature that makes it so your workers can’t see call reports from a personal computer outside the office) or give your staff and volunteers permissions to install the iCarol Certification Tool on their computer. You can read more about this here. Pros: You’re unlikely to get much push back from your volunteers or staff about this plan; the idea of staying warm, cozy, and off the roads will send many a helpline worker to their happy place. Plus, you won’t have to worry about people physically making it in to the call center for their shift. Worried about productivity? The term is referred to as “shirking from home” — the concern that your employees won’t actually get anything done and left to their own devices will shirk their responsibilities. The good news is, numerous studies have discovered that this is a generally unfounded fear. A Stanford University study of call center workers found home work resulted in a 13% performance increase, people took fewer breaks and sick days, and 4% more calls per minute handled thanks in part to a quieter and more convenient working environment. Home workers also reported improved work satisfaction, and their attrition rate was cut in half. These days there are plenty of communication methods available making it so that remote workers won’t feel disconnected. Keep in mind that with iCarol your supervisors can remotely silent monitor chat and text conversations, leave feedback on logged interactions, put out News alerts, send instant messages to your workers via Internal Chat, send emails and SMS messages, and more. Technology has made us more connected with one another than ever before, even if we’re physically separated by many miles. Cons: Most modern phone systems have many remote controls that allow you to sign in remotely and forward calls as needed, but some might require you to be on-site to activate the call transfers. If there are no remote capabilities for controlling where the calls are landing, then that means someone has to make it into the office to flip the switches, possibly rendering the work-from-home scenario moot. You’ll also want to consider home office digital security, and whether or not having employees work off-site violates the terms of any of your contracts. There’s also the matter of assuring your volunteers and staff have a suitable work environment free from distraction or disruptive noise or potential confidentiality violations. They also won’t be able to take advantage of some of the infrastructure that may be available at your center, like battery backups or generators in case of a power outage. Camping out – Marshmallows optional. When the forecast calls for dangerous weather and snow accumulations that might make travel impossible, make a decision ahead of time to suspend the usual schedule, and instead have a crew arrive prior to hazardous road conditions developing. This crew will stay for a period of time until travel is safe again and shifts can resume. Pros: Again, you’ll be free from having to worry about workers traveling or one shift getting stuck because relief didn’t arrive. The whole idea here is that they know they’ll be stuck for awhile, and they’re (hopefully) okay with that. This is a policy you could develop long before winter weather strikes, so that you aren’t faced with a chaotic scramble for a solution just before a blizzard hits. You may even cultivate your list of willing participants ahead of time as well. Being able to make these decisions in advance without the storm bearing down on you is certainly a benefit, simply activate the plan when needed. Cons: Directors, Managers, and other decision-makers will want to stay in close contact and clearly communicate expectations, especially concerning staff arrival time and decisions about when normal operations should resume. Volunteer or staff health and well-being is a concern. Does your call center have adequate facilities to keep them comfortable for an extended stay of 24 hours or more? Think about bathrooms, bathing and personal hygiene, and food access and preparation. Mentally and emotionally, how will your staff deal with being at the office for a long period of time? They’ll need to have regular breaks and take time for uninterrupted sleep, which means this plan usually requires at least two participants. You’ll also want to review labor laws in your area to be sure your policy doesn’t violate ordinances relating to a worker’s right to ample breaks, and whether or not additional financial compensation is required. 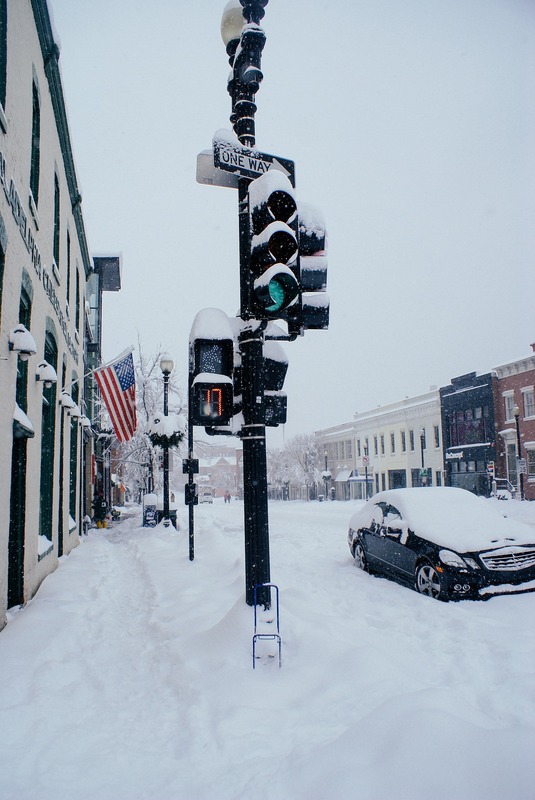 How do you keep your helpline operating in spite of dangerous travel conditions for your volunteers and staff?Do you employ one of the strategies above, or do you handle winter storm scheduling some other way? We’d love to hear about it! Leave us a comment! * While this article refers specifically to blizzards and other winter weather conditions, these strategies could be employed during any disaster scenario, natural or man-made. Have you registered for The Great Shakeout? If you read that headline and thought I was talking about a song by Taylor Swift, please read on. The Great Shakeout is coming and you should get involved. No, it’s not a song, and it’s not the latest dance craze. The Great Shakeout is an earthquake drill, and it’s held on an annual basis. And the next one is happening next week on October 15th. The Great Shakeout encourages everyone, whether you’re at home, work, or school, to practice what to do during earthquakes, and to improve your preparedness. Even if you don’t live in an area where earthquakes are a common occurrence, keep in mind that earthquakes can happen anywhere. I never expected to be in an earthquake where I live (Maryland) until August a few years back. There was a 5.8 magnitude earthquake whose epicenter was about 100 miles south of me. I had never felt anything like it before. It was incredibly scary to feel the office floor shift beneath me and feel my building rattle. And for awhile after there was no cell service, and even landlines weren’t connecting. It was scary to not be able to get in touch with family to make sure they were okay. Relatively speaking, it was a mild earthquake, but to a population of people who were mostly unfamiliar with the concept, it was frightening. And in that moment, none of us really knew what we were supposed to do to stay safe. The Substance Abuse and Mental Health Services Administration (SAMHSA) will provide up to $46.8 million in funding over the next few years to support suicide prevention programs as well as those that meet the emotional needs of people affected by disasters. According to a SAMHSA press release, one grant for up to $18.6 million over the next three years will be awarded to Link2Health Solutions, Inc. of New York, which manages the National Suicide Prevention Lifeline (Lifeline) and the National Disaster Distress Helpline (Helpline). The Lifeline, a national network of suicide prevention helplines which can be reached by dialing 1-800-273 TALK (8255) or via live chat through their webside, will be receive up to $15.9 million from the grant so they can continue to administer and grow the network. Since its inception, the Lifeline has responded to 7,514,238 calls from people in crisis. Last year it responded to more than 1.3 million calls, which is an average of 3,719 calls daily, nationwide. Our congratulations and continued appreciation goes out to the helplines that provide this service, many of whom we’re honored to have as clients. You can click here to read the full press announcement. The Points of Light Foundation will hold a free online disaster exercise next Tuesday that will help organizations, agencies, and volunteers be better prepared to respond to disasters. According to information provided by Points of Light, they are the world’s largest organization dedicated to volunteer service. They mobilize millions of people to take action in various opportunities. They have affiliates in 250 cities and partnerships with thousands of non-profits and corporations. Points of Light engages four million volunteers in 30 million hours of service each year. Operation Volunteer Placement allows agencies and organizations tasked with the coordination of spontaneous volunteers during a disaster to exercise their plan in a web-based simulation. Participants work together as a unified team in establishing, managing and demobilizing a Volunteer Reception Center. This exercise is intended for group interaction and should include local partners involved in the management of disaster volunteers, including EMAs and sister government agencies, VOADs, and other nonprofits. This exercise is self-paced and can be accessed between 9:00 a.m. and 4:00 p.m. ET. It lasts between 90 minutes and three hours, depending on group interaction. NOTE: While intended for group interaction, each participant should individually register to ensure receipt of post-exercise certificate of participation. To find out more about this exercise, and to register, visit this site.